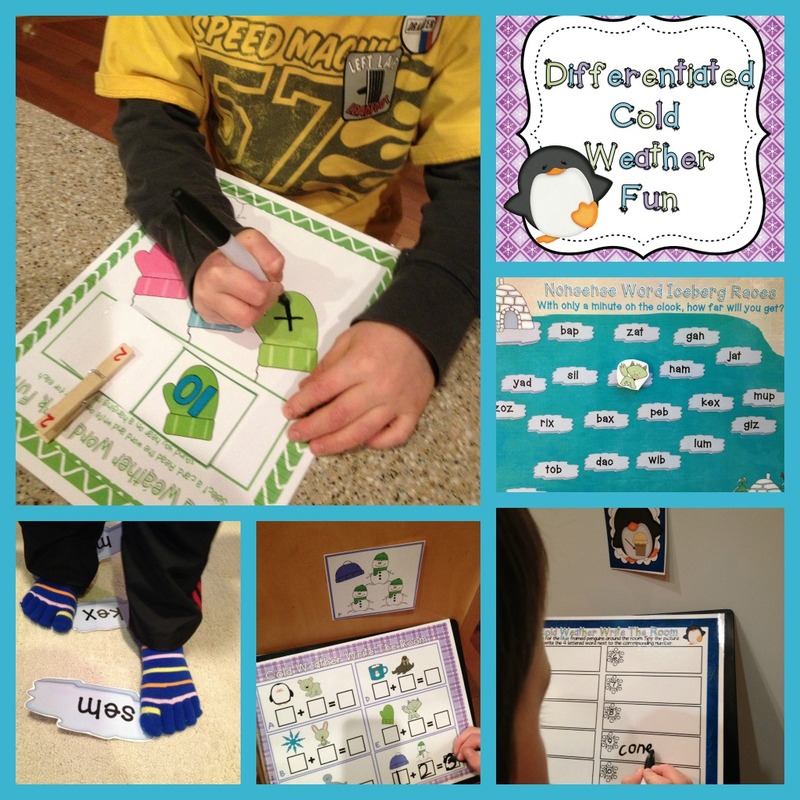 Cold Weather Plans and a Winner! For all of you just heading back to school on Monday, welcome back! I’ve already been back in the classroom with kiddos since Wednesday. I’m the first to tell you, it was not easy to head back but nice to see my kinders again. We actually were forced to start our vacation two days early due to a good ol’ fashion, Norther Michigan snowstorm. So I had a some activities planned and ready to go for my class that I wanted to get done regardless of the holiday season being over. I just couldn’t bring myself to not finish what we had planned or forget about a party. It’s kindergarten for goodness sakes, we live and breath for celebrations and so we had some post holiday festivities. In the meantime, it has given me a couple of extra days to solidify my cold weather station/center activities for January. 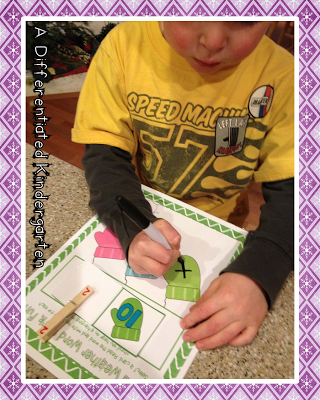 I outlined my math stations last week for you. 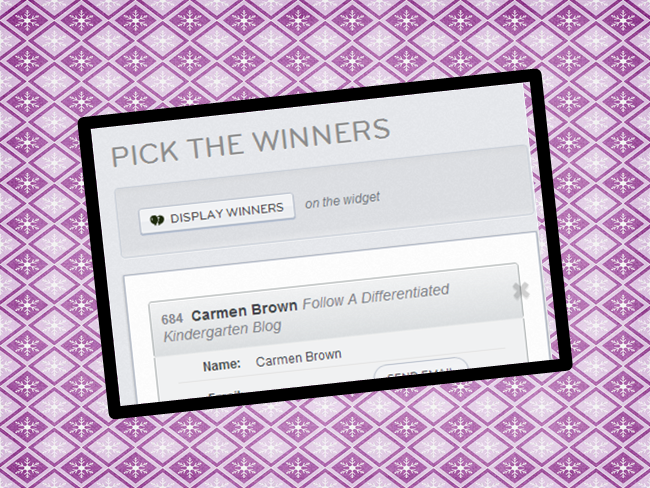 If you missed them, click HERE to get a peek. 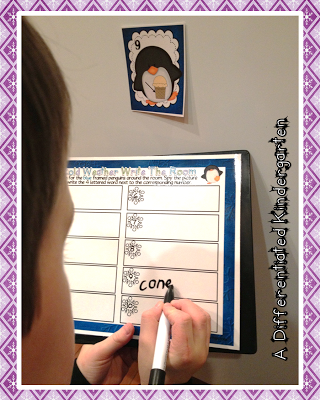 This self-correcting activity is differentiated to meet the needs of my kinders who are still working on letter sounds, those who have moved on to CVC words and students who are practicing CVCC/CCVC words. Students pick a mitten card and look at the picture. They write a letter on a mitten for each sound. Then they open the card to see if they did it correctly. Of course all of these have color or black and white recording sheets from which you can choose. 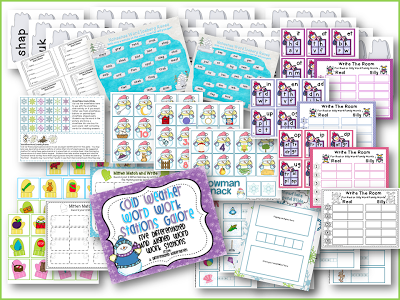 I understand that not everyone has access to unlimited color printing so I’m trying to make sure I can give you option to have some black and white recording sheets for most units. 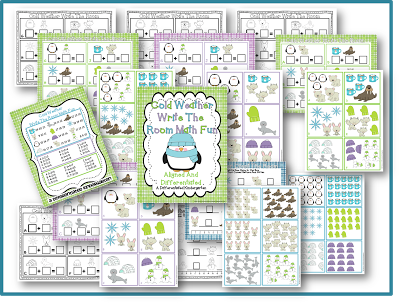 I know I”m gonna need to let my little movers roam during math stations too, so this one addresses counting (focusing on numbers 10-20 and what comes before and after) as well as addition 0-5 and 0-10 (each tier has 12 addition cards-6 per recording sheet- to find and record). Do you know how hard it is to ‘hide’ this many write the room cards in a classroom as small as mine? Somehow I still always hear, ‘Man, Mrs. McGuire, you really did a good job hiding those cards this time.’ I love how easily you can make a kinder happy. They love this activity. 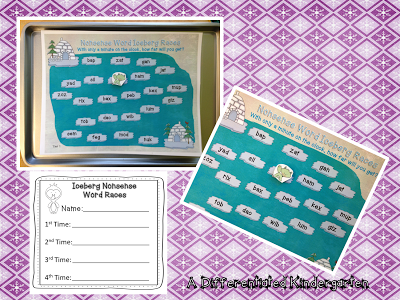 I have Diebels scoring coming up and I knew that I wanted to do some segmenting and nonsense work as well as rhyming so I put together several word work activities to help my kinders get some added practice. 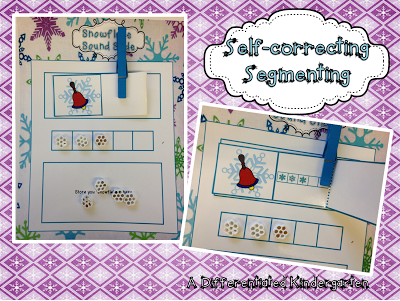 Snowflake Sound Slide (part of Cold Weather Word Work Galore) is a self-correcting segmenting activity using those fun painted snowflake pastas again (I use those things for EVERYTHING I tell ya.) 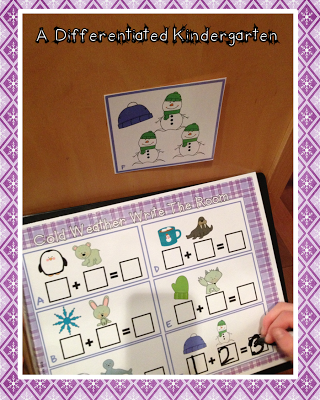 if you have them, or you can use the snowflakes I include in the activity. Students move a snowflake for each sound they hear in a word. In that same word work galore unit there are two different versions of an Iceberg Nonsense Word Race. For your kinesthetic honeys, there are floor nonsense icebergs. Students move from iceberg to iceberg as they say the nonsense words. There is a recording sheet where students can keep track of how well they progress each time they play this game. Or if you rather, there is a mat version that you can use game pieces on to move from iceberg to iceberg. For this, I actually put a small piece of magnet on the back of the playing piece and place the playing mat on a cookie sheet. I then take one of those high powered magnets and put it on the back of the cookie sheet so that I can move the playing piece with the magnet. It just makes it a little more challenging for students. 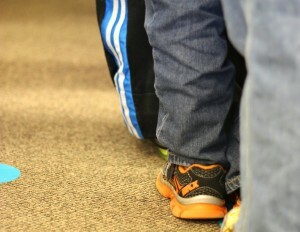 Of course, you can just use buttons, snap cubes or whatever other manipulative that you like. Include a small 1 minute sand timer for you students to time each other. Finally, my kinders would have strung me up if I didn’t get them an I-spy for math stations. So this one addresses addition 0-5 and 0-10 as well as subtraction 0-5 and 0-10. 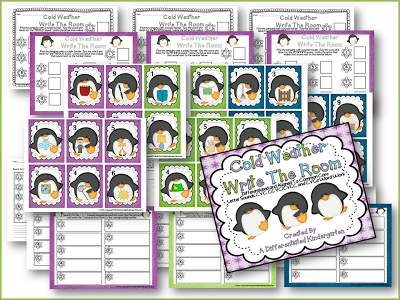 There are a couple different recording sheets depending on the readiness of your students. And that is about it for my scrambling this week. I have a couple of things in the works, including a freebie I think you’re gonna love so stop back. Congratulations Carmen and thanks so much to everyone for entering. Differentiated Ice Fishing! When In Michigan, Do As the Michiganders. I love your layout of our items. Would you mind sharing how you do that? Do you do a JPEG of each item, then create an larger image or do you print out and take a photo of all. They are brilliant! !This is one thing I need to work on is my previews.